Amber (ex tax attorney) and her husband, Eric Hoffmann, are a couple who have been travelling the world for several years, writing about unique, luxury food and travel experiences and have been voted one of the Viator top 20 Food Travel blogs in the world. They have approximately 80,000 Social Media followers (Facebook, Twitter and Instagram). Amber Hoffmann is also an acclaimed speaker at International Travel Blog Conferences. 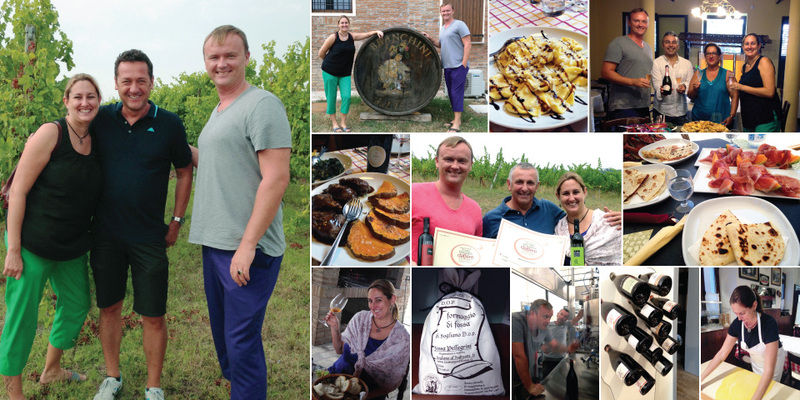 Amber and Eric reached out to Yummy Italy after their first trip to Emilia Romagna during which they had been hosted by the Emilia Romagna Tourist Board. Although the Tourist Board had put together a wonderful and insightful programme for them, they were also looking for some more singular and original experiences to write about on their blog. Amber and Eric have returned to Emilia Romagna several times and carried out numerous experiences with Yummy Italy, resulting a large number of articles published – from truffle hunting (and the ‘Truffle Egg that Did Us In’), to “Bologna Bubbles” (an analysis of Spumante Metodo Classico from the Bologna Hills), “How to Taste Real Balsamic Vinegar” and “How to Travel like Anthony Bourdain” . Both Amber and Eric are wine lovers, so we were only too happy, as regional wine experts, to introduce them to some wonderful producers and some new, autochthonous wines. Check out the Italy section on their website to see what they wrote about us.